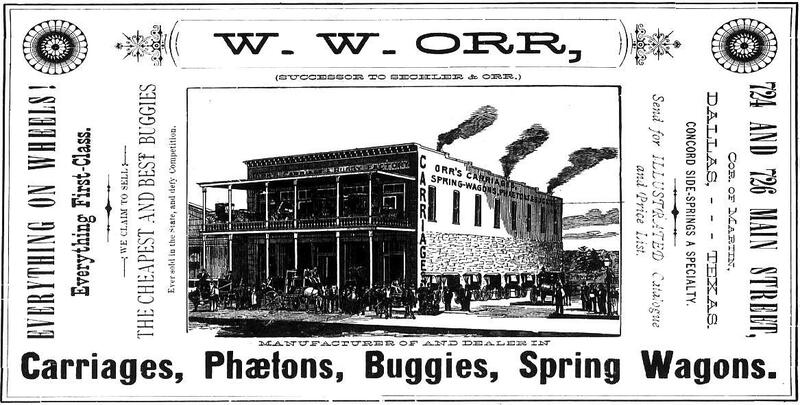 I came across the image above in the 1878 Dallas city directory, and my eye was immediately drawn to the novel open-air display of buggies on the second floor of the building. I’ve never seen this before — the frontier version of the auto showroom! I hope this is a depiction of the actual shop owned by W. W. Orr at 724-726 Main Street (corner of Main and Martin — see map below) and not some sort of early augmented clip art. 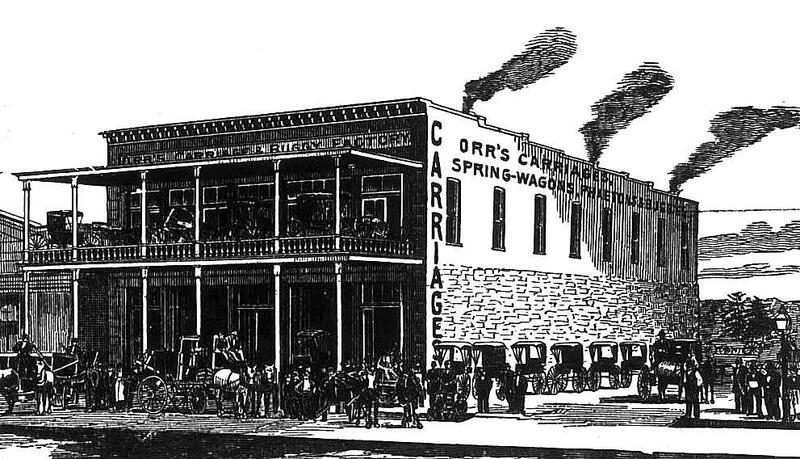 Orr ran a successful business selling buggies, phætons, and carriages, and he probably did have an imposing shop. William Wallace Orr was born in Ohio, and after the Civil War he made his way to Texas, where he served for a short time as an East Texas postmaster before coming to Dallas where he and his wife, Amanda, operated a livery stable. I’m not sure whether “epizootic” is used here as some sort of 19th-century tongue-in-cheek hard-sell advertising term (“His prices are INSANE!“) … or whether it means the horses have some sort of disease. I tend to think it’s the former. Regardless of what disreputable activities were going on in the cellar, it seems that Orr’s business of manufacturing and selling “everything on wheels” was a booming one. It’s interesting that Orr and his first wife are buried side by side in Greenwood Cemetery. Amanda Melvine McQueen Orr has a large, ornate monument and headstone; W. W. has his name — and nothing else — carved into an unadorned marker. It would have been nice to have had a little a buggy in the corner. …Something. Illustrated ad from the 1878 Dallas city directory. All other ads from The Dallas Herald, as noted. 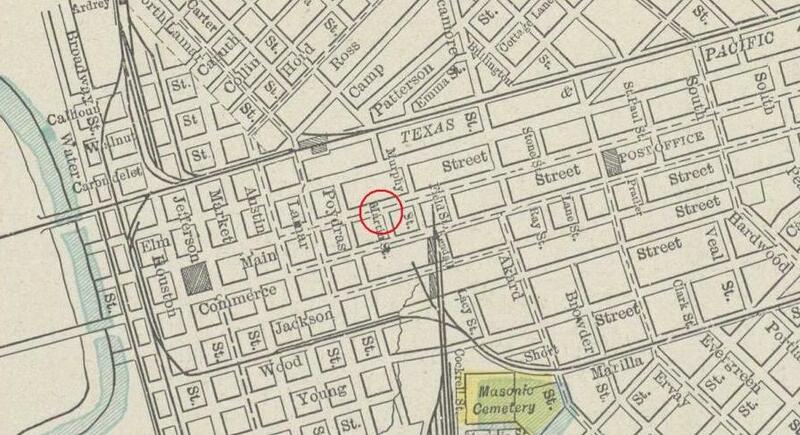 Map is a detail from a map of Dallas, circa 1900, from the Portal to Texas History, here. Amanda Orr’s headstone and memorial statuary can be seen in several photos here; W. W.’s sad unadorned slab can be seen here. Another fabulous and fascinating post Paula. Thanks for repeating it. I adore the comments about the altercation under Orr’s establishment. Folk back then were so colorful in their descriptive comments. You even explained phaeton for me. You never cease to amaze! !